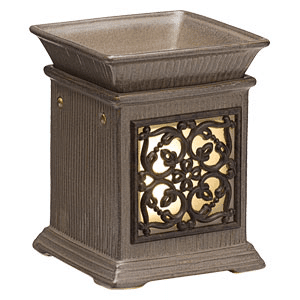 If anyone reading has not heard of Scentsy yet, they are an American company which provides beautiful room scenters, in the form of wax heaters. Basically it’s like burning a scented candle or an oil burner, but without the fire hazard of the smoke pollution. The scent from the wax is very strong and long lasting. I’ve always loved scented candles and candle products, but stopped using them once the children came along as I didn’t feel safe. With two school age children and a new puppy in the house the idea of room scenters suddenly seems like a very good idea. 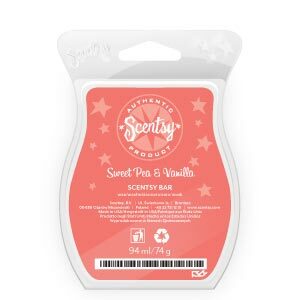 I have been aware of Scentsy for about two years now, and quite keen to give them a try. The burner I reviewed was a full size burner called Jane. The way it works is you plug it into the mains and a heating plate underneath the dish on the top, slowly warms the wax and releases the fragrance. The dish is removable for easy cleaning. There are about 30 different warmers in the range in lots of different colours, sizes and decor styles. I really like Jane – the bit in behind the latticework glows when it is switched on. I would have liked a separate on-off switch apart from just the plug, but it’s a small thing. The wax fragrances come in packets of 8 cubes – and retail for £5 each (3 for £14 or 6 for £25). Each cube fragrance is supposed to last for about 8-10 hours so the packs are very good value for money. Doesn’t that just make you want to go out there and try it – sounds wonderful and I’m sure it smalls wonderful too. Of the two scents that I tried, the whole family preferred the Sweet Pea and Vanilla one. I liked the cucumber and lime, but my husband thought it smelt a bit weird and the children were not keen either (there are special ‘man’ smells for your other halves…). I use the burner in the living room, and the scent goes throughout the downstairs of the house, up the stairs and into my bedroom. No smell of damp puppy anywhere as far as I can tell. As part of the review pack I received there was also a personal fragrance pack and a scent sachet – great for putting in a soft toy for your children or for the nursery (which they also sell). I think these would make really nice stocking filler gifts for people. Scentsy products are only available for sale through Scentsy distributors in the UK. The business is run on a standard party plan /distributorship model, with a low cost of entry, rising commissions as you progress through the ranks, and a bonus for recruiting a team underneath you. Scentsy is still a young company in the UK so there is still scope for making money – recruiting people under you, and doing parties, craft fairs and similar. As with all of this type of company, you can work as much or as little as you like – but do notice that if you are looking to succeed and/or make a full-time income you will need to put some serious effort in. The one thing I like about this business opportunity, is that all the people who buy the warmers are likely to come back to you regularly for supplies of wax, so there is scope for significant repeat business (which can be online). This is not the same with all party plans. As a Scentsy distributor , you decide how you sell,do you want to do parties, events or just sell through your friends. You can run a small business or a full-time business – it’s up to you. This business would work very well for you if you absolutely love the products and are happy to live in a permanently scented environment. One of the joys of any distributorship business is getting your own product supplies at discounted prices. I love the look of this business. I will certainly be returning to Liz for supplies for my burner, and if I didn’t already have four businesses on the go, I would be tempted to have a go at this.